I’m not much of a Venom guy, so normally I wouldn’t have picked this one up. But Donny Cates’ name attracted me to it. He writes Babyteeth over at Aftershock, which I’ve really enjoyed. So I’m giving this one a whirl for him. I’m not the world’s biggest Scott Snyder fan. He’s hit or miss with me. 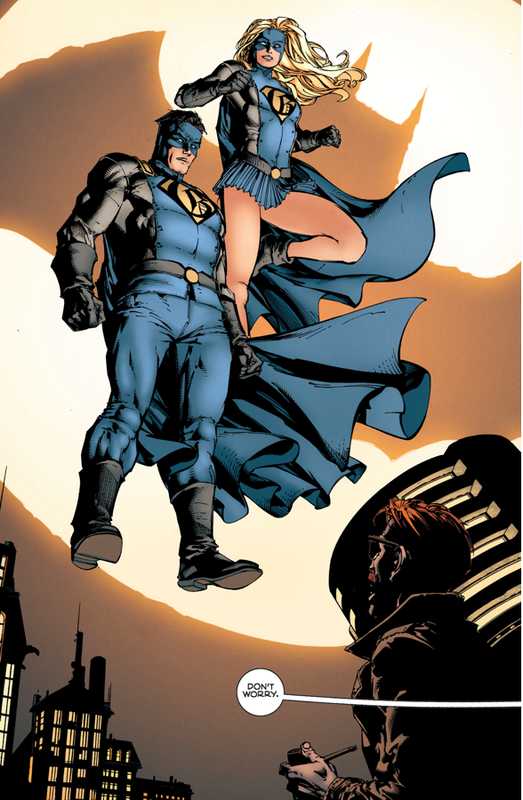 But the Justice League portion of DC Nation #0 piqued my interest. 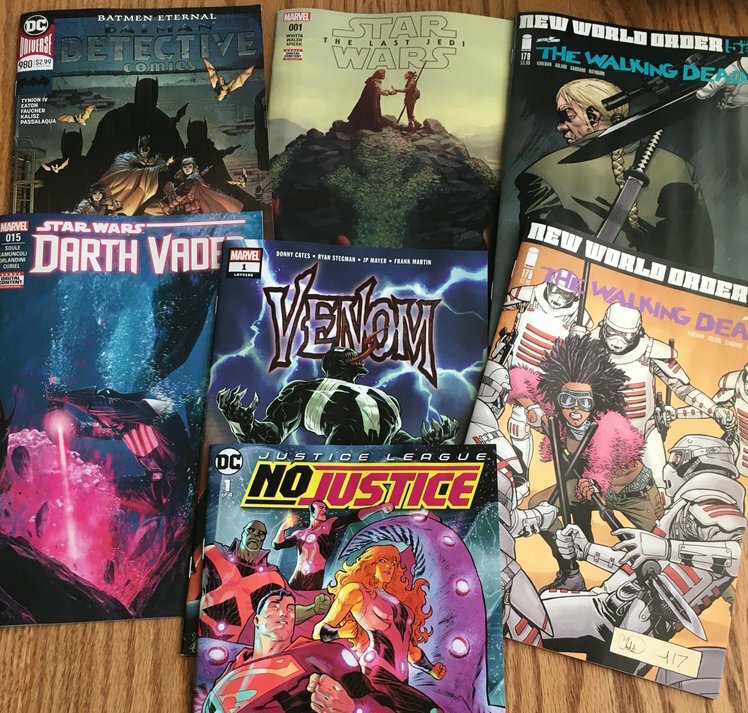 Plus, James Tynion IV and Joshua Williamson are attached, and I dig both of them. 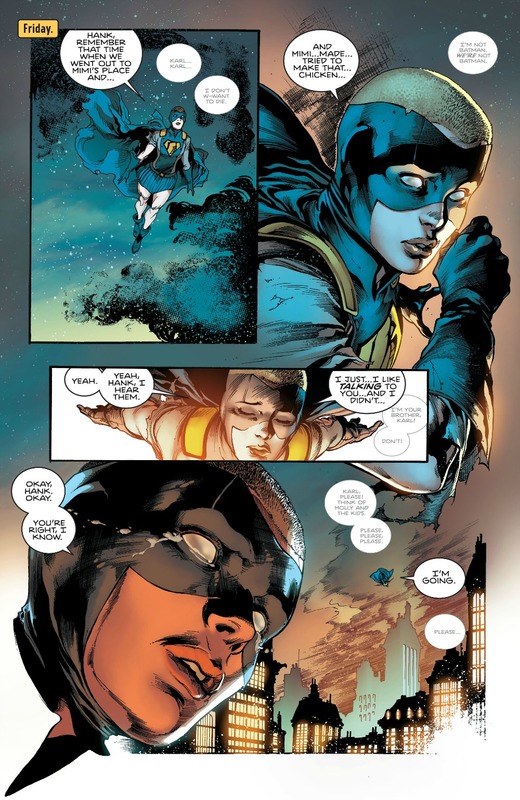 Francis Manapul is also an artistic deity. This has been proven. 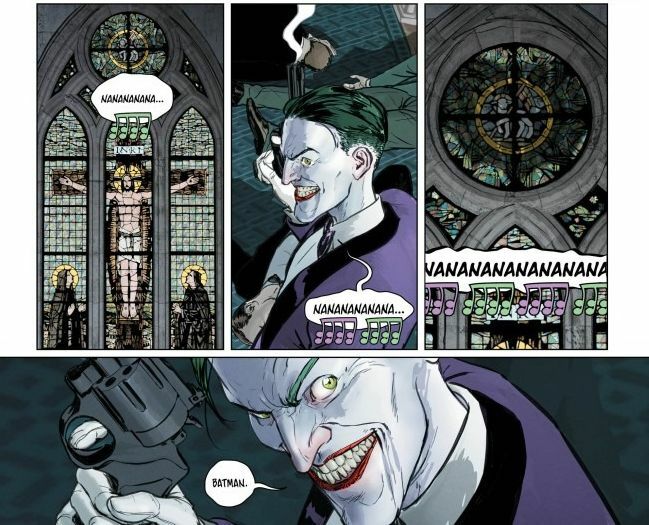 James Tynion IV is my favorite modern Batman writer. The fact that he’s bringing back all this ’90s and early ’00s stuff is a just a bonus. I don’t normally pick up these Star Wars movie adaptations from Marvel. But the preview for this one caught my eye. A portion of it is done through Luke’s point of view, which is a nice little added hook. In recent months, I’ve slept on The Walking Dead a little bit. It was partially intentional, and partially cost-related. I’m intrigued by the new direction they’ve taken things, but they obviously didn’t grab me hard enough to keep me buying month to month. Here’s hoping the combined effort of these two issues will change that. I’ve had to hold back on Darth Vader as well. This one was strictly a cost thing. Like issue #14, this one might be a candidate for “Epic Covers.” For some reason, part of me is always surprised when someone uses a lightsaber underwater. Luke just did that in Star Wars #48. Did they work that way in the “Legends” continuity? 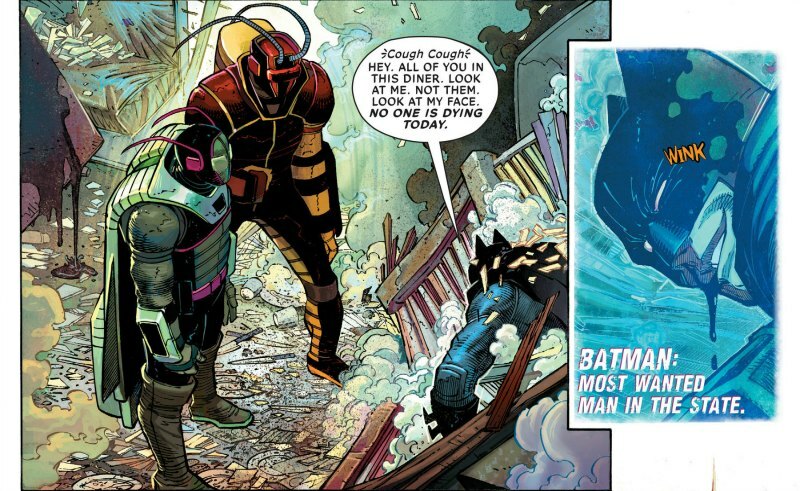 This entry was posted in Comic Books/Graphic Novels and tagged Darth Vader, Darth Vader #15 (2018), DC Comics, Detective Comics #980 (2018), Donny Cates, Francis Manapul, Image Comics, James Tynion IV, Justice League, Justice League: No Justice, Justice League: No Justice #1 (2018), lightsaber, Marvel, Rob Siebert, Scott Snyder, Star Wars, Star Wars: Episode VIII - The Last Jedi, Star Wars: The Last Jedi, Star Wars: The Last Jedi #1 (2018), The Last Jedi, The Walking Dead, The Walking Dead #178 (2018), The Walking Dead #179 (2018), Venom #1 (2018), Venom (Marvel), Weekly Comic Haul on 05/09/2018 by primaryignition. I feel like every time I review something Scott Snyder writes I have to go through the same spiel: I generally like his stuff, but he does certain things that make me mad as hell. 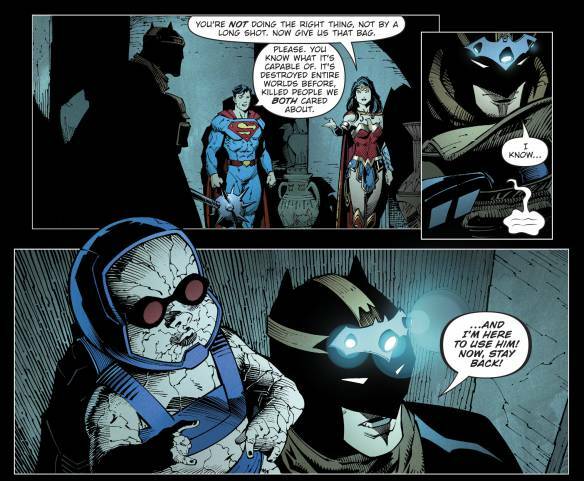 As such, it’s difficult for me to look at Dark Knights: Metal in an unbiased manner. I commend Snyder for weaving classic DC Comics elements into the fabric of Metal. Not just the perennially under-appreciated Hawkman, but the Challengers of the Unknown and the Metal Men as well. We even get little nods to places like Dinosaur Island. The League even travels to Blackhawk Island for briefing. It makes the whole Dark Multiverse concept feel a little more organic. We even get an appearance by a famous Vertigo character as part of our cliffhanger. It’s great to see Greg Capullo back in the DC Universe. He, inker Jonathan Glapion, and colorist FCD Plascencia give us an opening sequence with the League in a battle arena on a new Warworld. Naturally, it’s ruled by Mongul. Capullo puts our heroes in armor that is ironically attuned to their weaknesses. Thus, they’re essentially fighting as regular civilians. I’d say there’s at least a 50/50 chance we see these made into toys eventually. My two favorite pages in the issue are back-to-back. The first is when we see Red Tornado attack the League on Blackhawk Island. Capullo’s take on the character’s cyclone powers are interesting, as they engulf the entire scene. 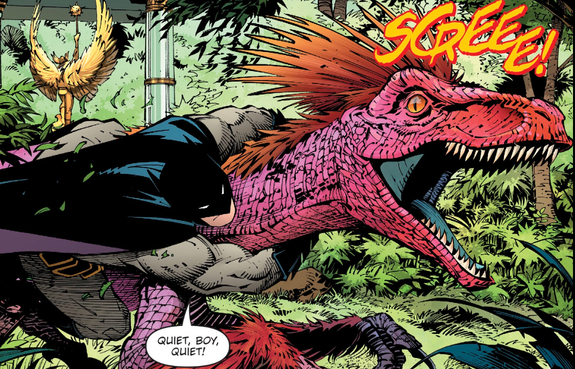 Then on the very next page, we get a shot of Batman riding a dinosaur off the island (shown below). Hokey? Yes. But Capullo plays it somewhat comedically. Plus, there’s a giant dinosaur in the Batcave. So in a ludicrous way, it fits. Alright, now I get to poo-poo the Snyder party like I always do. Let’s talk about robots, shall we? 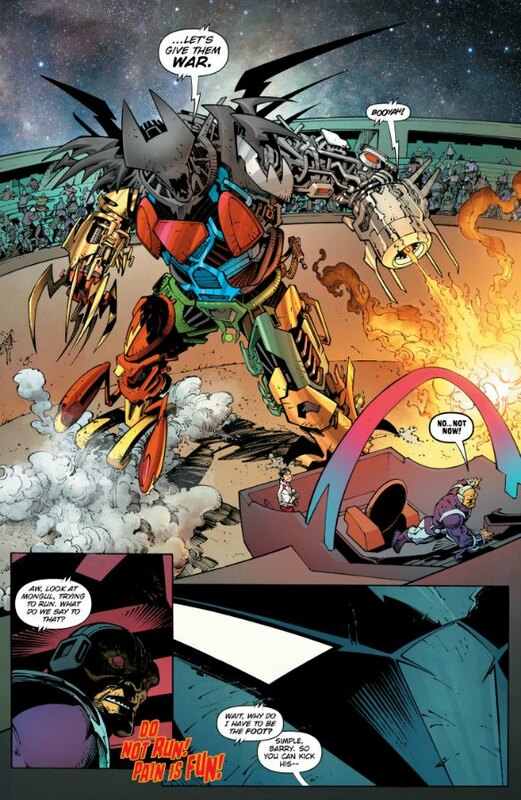 Scott Snyder and Greg Capullo have a thing about big (sometimes giant) Batman robots. I’ve talked at length about this before. They just can’t help themselves. 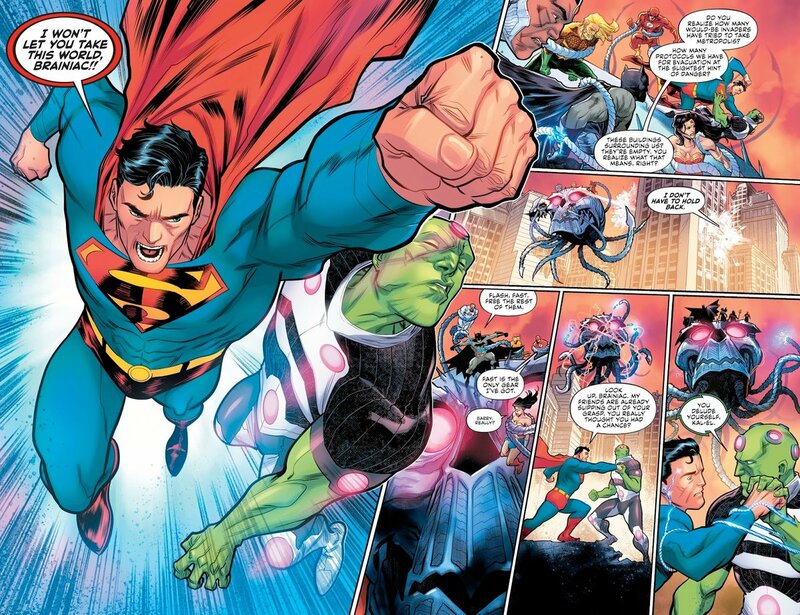 So it really should have come as no surprise that in the Warworld arena, the Justice League is fighting a bunch of giant robots attuned to their specific abilities. And of course, what’s better than the League bunch of giant robots? The League taking control of the robots and forming one GIGANTIC robot! Justice League Megazord, power up! OMIGOD U GUYZ!!!!!!! On it’s own, this is fine. A little stupid for my tastes (And that’s coming from a Power Rangers geek! ), but fine. But when you take in to account how much these guys have used big awful Batman robots before, it’s actually laughable. Honestly, did we have to go with the giant robots again? I understand the story is called Metal, and it behooved them to go with a mechanical threat. But this scene with Mongul and the Megazord doesn’t connect to the Dark Multiverse stuff anyway. So why not give Capullo and the team something new and fun to draw instead of going back to the giant robot well? 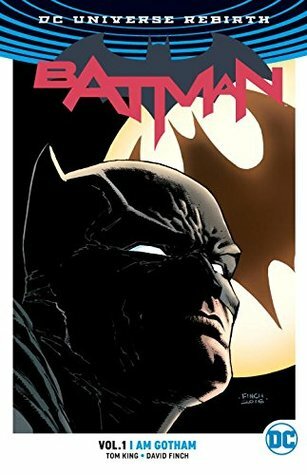 My second big complaint with the Metal story overall has to do with Batman and the “chosen one” narrative. In all fairness, this is a problem that goes beyond Snyder and Capullo. I’ve called it “over-Baturation.” On Blackhawk Island, Kendra warns of a beast as old as the universe itself, Barbatos, arriving from the Dark Multiverse through a human doorway. Based on clues she’s discovered, she theorizes Batman is that doorway. She then tries to spring a trap on him, and thus the Dark Knight escapes on said dinosaur. 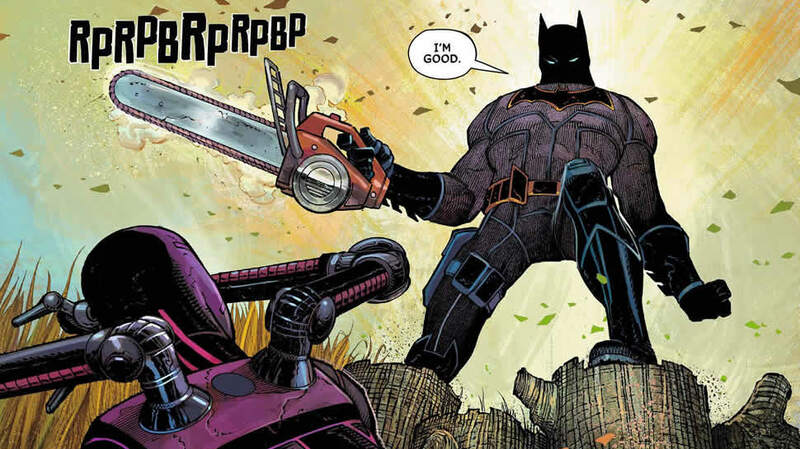 Metal is meant to be Batman-centric. Yet another milking of DC’s biggest cash cow. 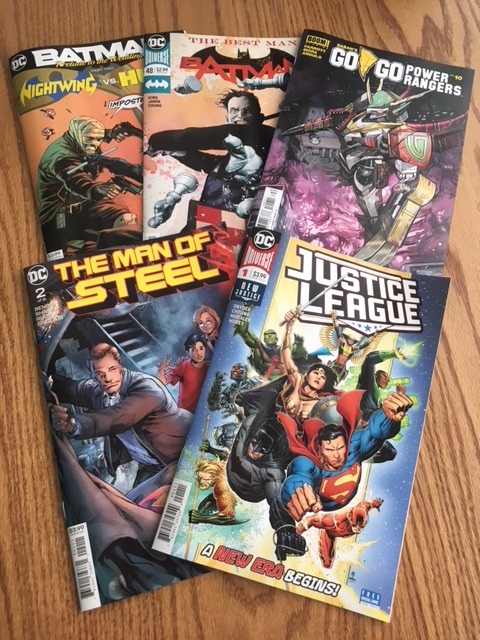 As a DC reader, I’m used to that by now. I just wish they didn’t have to portray Batman and the Wayne family as a cosmic centerpiece to so many things. From an in-story perspective, it makes him more prominent than he should be. 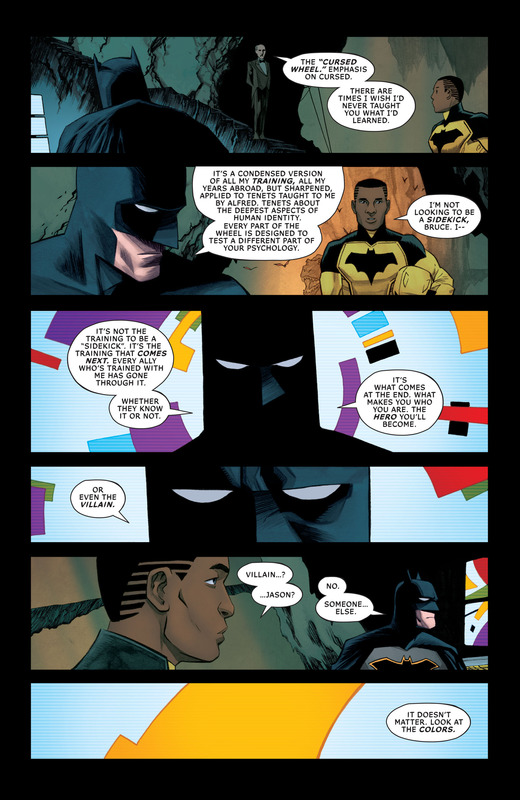 Even as a founding member of the Justice League, the world’s greatest detective, and all that stuff, what is Batman at the end of the day? A street-level crime fighter. So the idea of a demonic entity from another universe depending on him to open a cross dimensional gateway doesn’t fit for me. 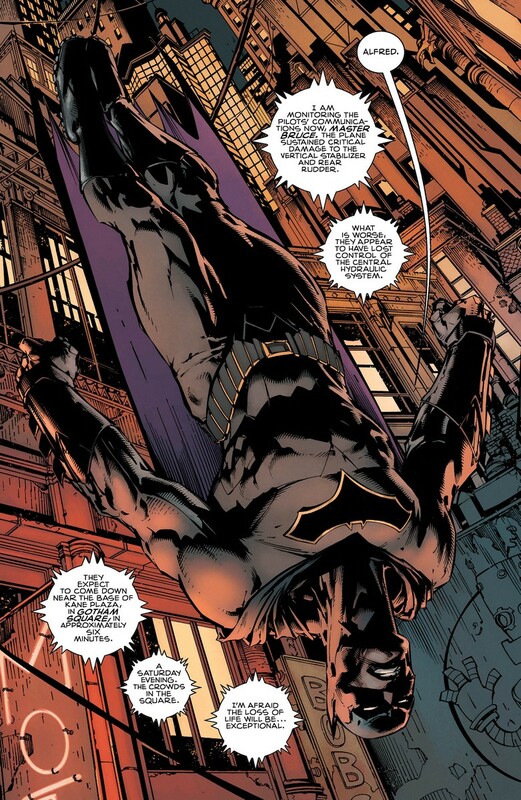 Why can’t Bruce just be investigating the Dark Multiverse, and let the bad guys in by accident? Why does it have to be a prophecy? 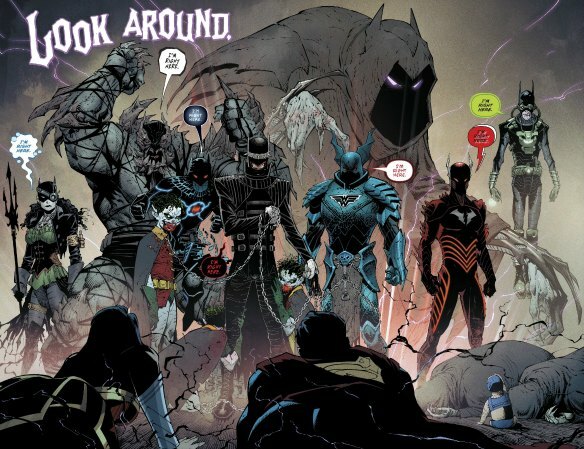 Hell, why is it that the Dark Multiverse creatures we’ve glimpsed all seem to be twisted and evil amalgamations of Batman and various Justice League characters? 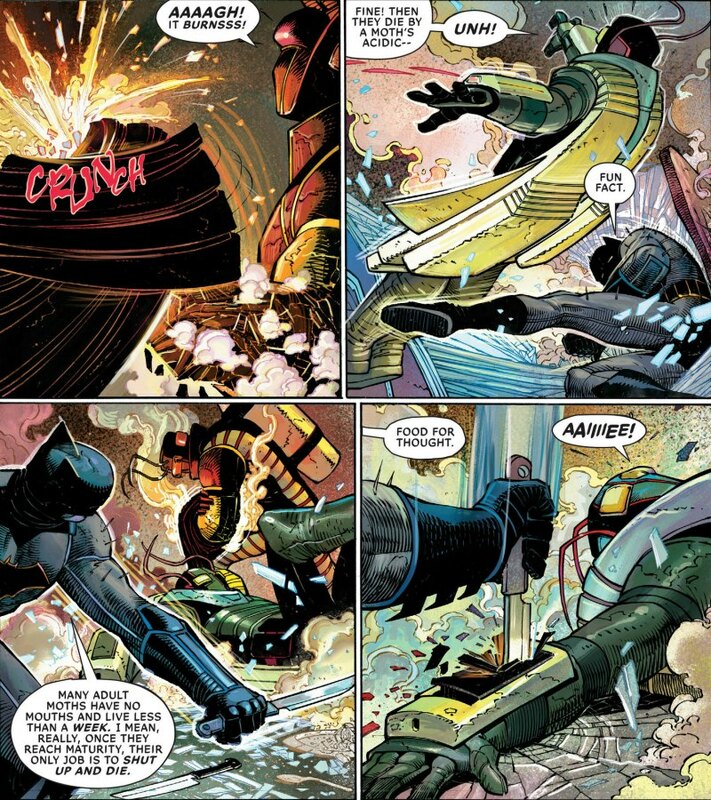 (For instance, the spin-off Batman: The Murder Machine is about an evil Batman/Cyborg blend. Batman: The Red Death is Batman/The Flash, etc.) 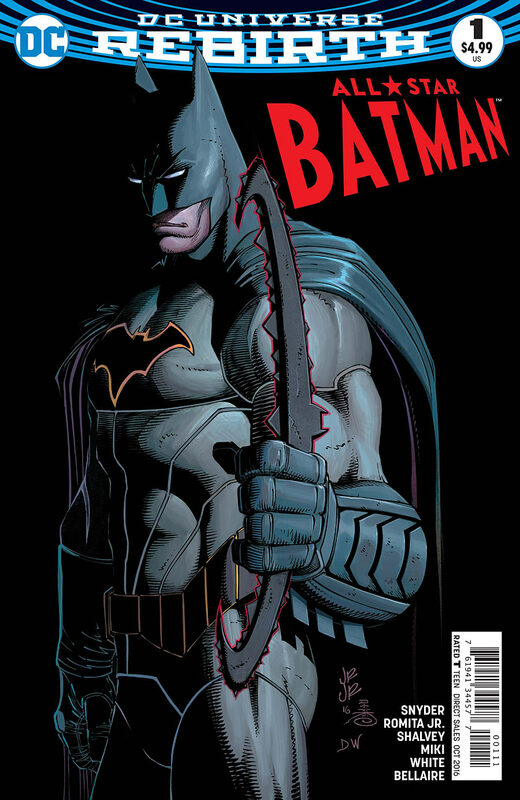 For that matter, why can’t we use this Metal aesthetic on other characters and not drag Batman into it? Yes, he has the iconography of a demon, and is thus more suited to it. 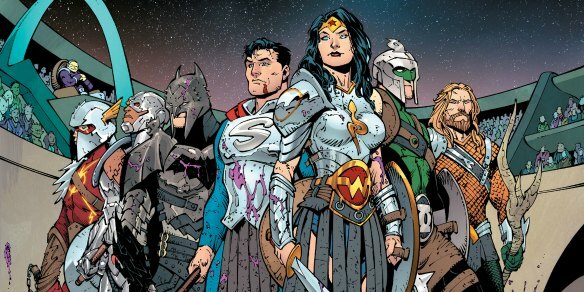 But are you telling me no one has any kind of take on a “metalized” Wonder Woman? How about Cyborg or Aquaman? You can make your event Batman-centric without having to put Bat-ears on everything! Does everything have to be a giant Batman circle jerk? *whew* Okay. I’m done. No, seriously. I am. 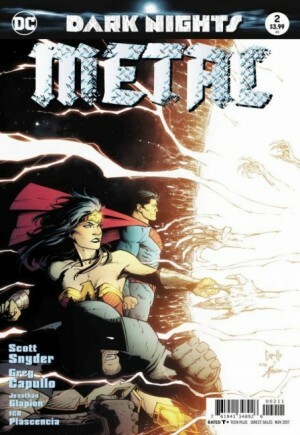 In the end, I’m sure DC will make decent bank on Metal, and I’m sure there’ll be a lot of cool creativity on display. The heavy metal inspired tonality is something fairly different for a superhero event comic. Greg Capullo’s art may be worth the price of admission on its own. 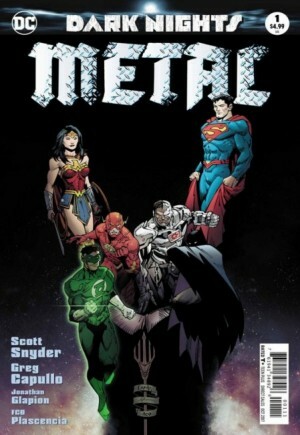 But as far as I’m concerned, for better or worse, Metal represents more of the same from Snyder and Capullo. A lot of awesome ideas, mixed in with a lot of infuriating ideas. And giant robots. Lots of giant robots. This entry was posted in Wrestling and tagged Aquaman, Batman, Batman comics, Blackhawk Island, Blackhawks (DC Comics), Challengers of the Unknown, comic book reviews, comic books, Cyborg (DC Comics), Dark Multiverse, Dark Nights: Metal, Dark Nights: Metal #1, DC Comics, DC Multiverse, Dinosaur Island, event comics, FCD Plascencia, Giant Batman Robots, Green Lantern, Greg Capullo, Hal Jordan, Hawkgirl, Hawkman, Jonathan Glapion, Justice League, Kendra Saunders, Megazord, Mongul, Nth Metal, Red Tornado, Rob Siebert, Scott Snyder, single issue reviews, Superman, The Flash, Wonder Woman on 08/21/2017 by primaryignition.